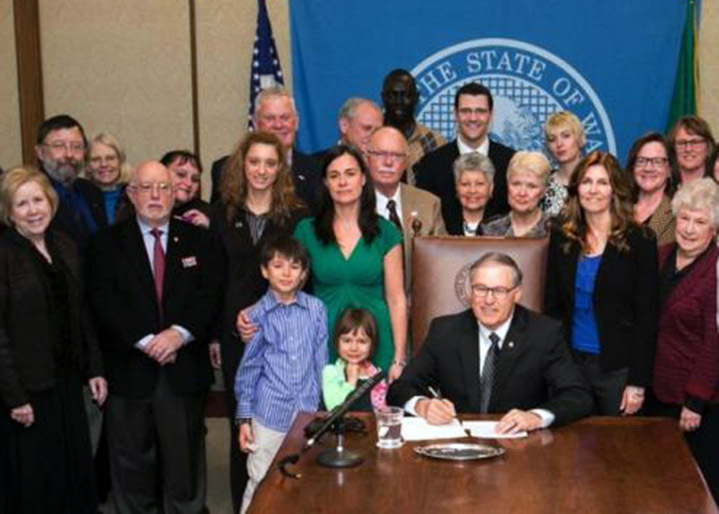 Suicide prevention in Washington state took a significant step forward March 27 when Gov. Jay Inslee signed House Bill 2315, a bill that requires basic training in suicide assessment, treatment, and management for medical care providers. The bill had passed 94-3 in the House and 49-0 in the Senate of the Washington State Legislature. Forefront, a suicide prevention program at the University of Washington, was instrumental in this first-of-its-kind state effort. Forefront brings together suicide prevention experts, clinicians, students and loss survivors to advance big-picture changes in public policy, training, and communication about mental health, mental illness and suicide prevention. Forefront’s contributions to the bill’s grassroots success included: helping to convene stakeholders to craft the legislation; contributing expert testimony for committee hearings; working with suicide-attempt survivors and those who have lost a friend or relative to suicide to tell their stories, and organizing a lobby day so citizens could explain the importance of suicide prevention face-to-face. The bill’s chief sponsor and tactician, Rep. Tina Orwall (D-Des Moines), who earned her MSW at the UW School of Social Work, describes this bill as the third prong in the suicide-prevention call for action that started with passage of the Matt Adler Suicide Assessment, Treatment and Management Act, passed in 2012. The bill is named for a Seattle lawyer, the late husband of UW School of Social Work faculty member Jennifer Stuber. Adler, who suffered from depression and anxiety, took his life in 2011. Stuber helped mobilize a statewide coalition of supporters for the bill, and went on to launch Forefront, in collaboration with nationally recognized suicide prevention expert Sue Eastgard. Watch the bill signing ceremony. Stuber is in a green dress and is accompanied by her and Adler's two children, who received the signing pens.